The field work mentioned in this blog was part of the IITA led Cassava Monitoring Survey project, funded by institutions including the CGIAR Research Program on Roots, Tuber and Bananas. Read the full results of the survey in the Cassava Monitoring Survey report. By Jeff Bentley for AgroInsight. What women don’t say can be as important as what they do say. As I learned recently in Nigeria. Cassava is a crop that is native to the Amazon Basin, but spread in early colonial times to much of tropical Africa. The hardy cassava is a short, woody shrub that can live for several years, thanks to its large roots which absorb water and nutrients, which helps the plant to survive the dry season. Villagers love cassava because of its flexibility. People can harvest the plants one or few at a time, as the household needs food. But cassava can also be tricky. Once the roots are harvested they are fairly perishable and should be prepared into food fairly soon. During a recent fieldwork sponsored by the International Institute of Tropical Agriculture (IITA), we found that, in Southwest and North Nigeria, men grow much of the cassava and women detoxify it by making it into several products, especially one called gari. To make gari, women peel huge piles of roots, one at a time, with a kitchen knife. Then the roots are grated in little motorized grills, and the mash is fermented in sacks, and then the moisture is squeezed out. Men may help with the grating and pressing out the moisture (often for a small fee). Then the women toast the mash into gari on a metal pan over a hot wood fire, continuously stirring the mash with a wooden paddle. The women also collect the firewood. Women can sell gari in village markets to buyers, usually women, who bulk the gari and take it to the cities. To get cassava to transform into gari, Nigerian women use several strategies. 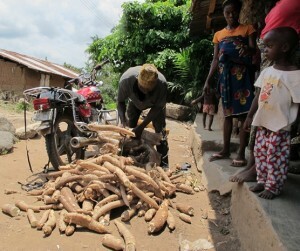 They grow some cassava; they get some from their husbands and they can buy roots in the village. In the photo, a man sells a motorcycle load of cassava to a neighbor who will process it. Within four to five days women can turn the cassava into a bit of cash—which they can spend or keep. In the villages across Nigeria my colleagues and I interviewed the men and the women separately. Some of the men told us that, among other things, they needed what they called “ready markets,” meaning that the men wanted to be able to sell their cassava roots raw, in local markets, for a profit. In separate meetings, the women had plenty to say, but they never mentioned markets. On the other hand, the women wanted cassava that was easier to peel. If we had interviewed men and women together, the women would not have bothered to contradict the men, when they asked for better markets for cassava. The women did not ask for a ready market for cassava, because they already have one. They can always carry a basin full of gari down to the village market and sell it. Even landless women can buy cassava and transform it to make a living, working at home. Men and women may even have conflicting interests. Higher prices for raw roots might benefit men, but could even harm the women, who buy the roots as raw material to make traditional foods like gari, fufu (with the consistency of mashed potatoes) and abacha (almost a kind of noodle). In Nigeria, women are quietly feeding the nation; they are happy with the market just the way it is. That is why women don’t ask for ready markets. What women don’t say can be as important as what they do say. To learn women’s specific views and perspectives, we were reminded one more time that it is important to interview men and women in separate groups. Read the original post on the AgroInsight website. This entry was posted in News, News & Events and tagged Africa, cassava, gender, IITA, postharvest, value chains on Jul 27, 2016 by RTB.